My fascination with weather extends beyond my days as a TV weathercaster. 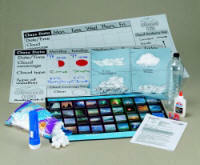 I have written and developed a number of weather based science kits, as well as other teacher science projects for educational curriculum companies. Science Kits & Boreal Labs, Delta Education, Highsmith, and Evan-Moor to name a few. In addition to science kits, I have several books available on weather, including teacher resource guides. 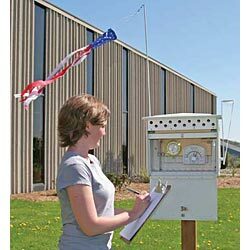 This new and improved, self-contained weather station features post and post spike for easy installation. The lock and key instrument box is double roofed with latticed sides for circulation. Instrument panel includes the barometer, sling psychrometer, dial min/max thermometer and hand held pocket anemometer. A windsock with swivel dowel, rain gauge, liquid filled compass and clip board complete the station. Both instrument and assembly instructions are included. Some assembly required. Instructions included. Size: station: 33 cm W x 33cm H x 20cm H; post: 10cm x 10cm x 1.22m. Grades K–12. Science Kit developed the Cloud Kit with Mike Graf. The kit includes two sets of lesson plans and student activities geared to Pre-K - 3rd grade and 4th grade - 8th grade. Also Included is a color-coded cloud identification chart and Daily Cloud Chart. 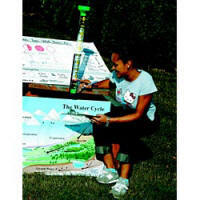 Your students will be able to understand the water cycle, list different forms of precipitation and their symbols, observe annual rainfall totals in major cities, read and set up the included rain gauge, read and record rainfall data on the included weather chart, graph rainfall data - and have FUN while they are doing it! Two levels of instructions included for pre-k-2nd grade and 3rd-8th grade. Students will develop a deeper understanding of core science topics through reading and writing exercises that make connections to real life. As they explore a variety of topics and writing styles, students' writing and higher-level thinking skills improve. Student writing samples provide an authentic assessment of topic comprehension. 32 cards in each set, Published by Highsmith Inc. In Earth Works, learn about the many landforms of Earth and the forces that affect their changing shapes. In Water World, learn about the Earth's water, what lives in water, its properties, and its cyclical characteristics. Co-authored, these guides are written as enhancements to the Earth Works and Water World: Science in a Nutshell Cluster Kits, which are thematic science units that include materials and activities.